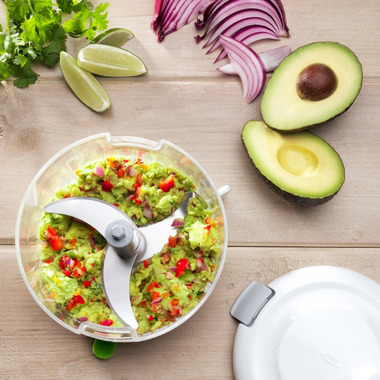 Whip up anything from pesto to guacamole with the OXO One Stop Chop Manual Food Processor. 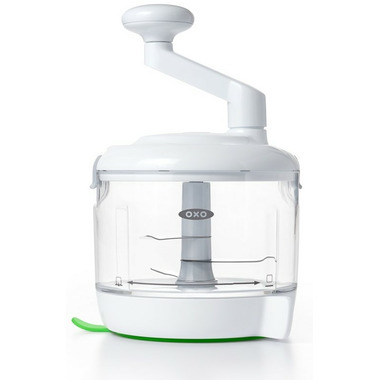 The sharp blades cut through fruits, vegetables, nuts, and more. Whether you’re chopping tomatoes into larger chunks for salsa or puréeing chickpeas for hummus, the texture is up to you and how many times you turn the comfortable handle. Easy to use, easy to clean, easy to impress your friends with your homemade creation. This product doesn't work very well at all. I was hopeful that it would be able to make hummus, which thinking about it was kinda naive. I wouldn't really recommend this product for anything. Haven't successfully used it for anything. Even pesto.